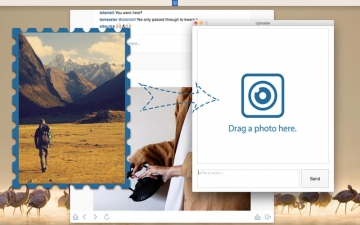 [無料] App Insta for Instagram - photos viewer and uploader for Instagram | Mac App Storeのアプリ検索・ランキング BuzzMac! App Insta for Instagram lets you access Instagram directly from your menu bar. Keep up to date with the people you follow and like or comment on photos. It even auto updates your feed while you are away. Just click the icon in your menu bar and sign it with your Instagram account, its that simple. You can also switch to the stand alone desktop mode for full window experience as a pro user. Please note: A Instagram account is required. Legal Note: App Insta for Instagram is a 3rd party app and is not affiliated with Instagram what so ever. Instagram and its logo is trademarks of Instagram LLC.